If you follow ed tech news, you know that augmented and virtual reality are huge buzzwords these days. But while the tech may look cool, cost and availability often make it something that most classrooms simply can’t support. That doesn’t have to be the case, however, as there are options for lower cost, readily available AR/VR options. One of these is the MERGE Cube. This tiny foam cube can be used to bring to life a wide range of educational apps. Not sure how it works or if it would be worth getting for your classroom? Let’s explore! The Merge Cube merges the physical and digital worlds using augmented reality technology and the powerful camera and sensors in your mobile device. It’s the first object of its kind, and it’s fundamentally changing the way people interact with technology. Now you can hold a galaxy in the palm of your hand, examine fossils and ancient artifacts like a real archaeologist, watch as a volcano erupts before your eyes, and play games in ways never possible before! MERGE takes its name from the way the device merges augmented/virtual reality with mixed reality (you hold the cube but see a virtual representation through the screen as you rotate it). To use it, you register the device, download an app from the MERGE Miniverse on a tablet, smartphone or VR device, and then sync up your cube with the app. It’s pretty simple, and many of the apps are free, though some that are more in-depth can be a bit pricier. The cube itself, however, is very inexpensive. Prices range from $10-$5 per cube (for awhile many places had them for just $1), and students can use their own mobile devices to interact with it (here is a list of compatible devices), making the overall cost fairly low. Why Use a MERGE Cube? So why use one of these cubes? For those looking to explore AR/VR in the classroom, it’s an inexpensive entry point and one that has a lot of flexibility. Apps available for the cube cover a wide range of topics and while not strictly educational (there are a fair amount of games, too), there’s plenty of educational content. Don’t see what you like? You can actually build your own app with a little bit of tech know-how. While it likely won’t radically change how you’re teaching a course it can be a great tool to get students excited about the subject–it works well and will be novel to even the most tech-inundated students. How Can You Use a MERGE Cube in Your Classes? 57 North: This is a choose your own adventure type game. It’s excellent for exploring storytelling and problem solving. Galactic Explorer: Help your students visualize the solar system with this hand-held model version our galaxy. Mr. Body: This app is a really basic introduction to the body’s systems and organs. There are a lot of other anatomy apps in this vein as well (AnatomyAR+ is also a cool one), so look around to see what fits your needs. HoloGlobe: Explore the globe in the palm of your hand with this Earth-modeling app. Museum Viewer: This app gives students a chance to see what it would be like to hold museum artifacts in their own two hands. This is set to be released sometime later this year. 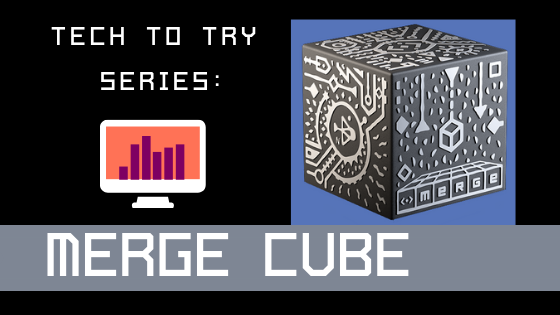 Aside from the apps that are more obviously directed at certain types of learning, there are other ways that you can use the MERGE Cube to teach in your classroom. Here are just a few ideas. Have students develop their own augmented reality. MERGE encourages students and teachers to become developers themselves. Check out the developer documentation. MetaVerse can also be a powerful tool for this application. Assign students to review their learning experience with the cube. Some students are going to love the cube and some are gonna be underwhelmed. That’s just how things go with any tech tool. Challenge students to explain what they felt were the best and worst parts of using the cube for learning and where they see AR/VR tech going in the future. Ask students to use the cube as part of a video report. It’s easy to record your interactions with a MERGE cube on the mobile device you’re using it to power it. This could be done in front of a green screen or edited together with other clips and used to create a really cool virtual report. Encourage forward thinking. While the cube might be limited in its scope today, challenge students to be future thinking and explore some ways that the technology can or will change in the coming decades. Will it ever become a part of the average classroom? How can developers keep costs down? Find out what your students see as a possible future for AR/VR tech. Obviously there are more ways to engage with the MERGE Cube than this, but these can hopefully act as some interesting jumping off points for thinking about using AR/VR tech in the classroom. So what’s the deal with the MERGE Cube? Here’s our quick take. Pros: Relatively inexpensive, can make course materials very fun and engaging, lots of different applications and you can even build your own. Cons: Requires apps that can cost money, you need need mobile devices to use it–some students might not have one that’s compatible. Verdict: If you’re looking for a relatively inexpensive way to bring the AR/VR trend into your classroom, the MERGE Cube might be a good place to start. It’s fun, easy to use, low cost and can be used in teaching everything from astronomy to healthcare. This entry was posted in Tech to Try and tagged AR, augmented reality, merge cube, virtual reality, VR. Bookmark the permalink.